It turns red and feels hot, just massaging my skin. It happens when I apply any product to my face, whether it’s skincare or makeup. This happens not necessarily because of the product, but because of the mechanical friction I apply on my skin, either with my fingers or a brush. This friction stimulates the blood flow (and other processes), which in turn leads to my flushing. See it happen here in My Rosacea Foundation Routine. 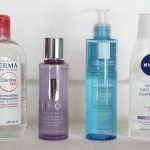 Because my skin is sensitive, is very important for me to find cleansers, serums, moisturizers and makeup that doesn’t irritate my skin or worsen my redness. I’m due to write a blog post about what “sensitive skin” really is. As part of my skincare routine cleansing is the most crucial step. If you haven’t removed your makeup properly, then it doesn’t matter how expensive your serum or moisturizer is – your wasting your money and time! Click on the different steps to read the individual blog posts. Today I’m giving you the details of step 2, the cleansers. One of the world biggest rosacea organizations, www.rosacea.org, has a physisian, Dr. Wilkin, who recommends, that people with rosacea should use a non-soap cleanser. So what’s a non-soap cleanser? It a cleanser containing less than 10 percent soap. They are often formulated as gels or creams, creating minimal or no foam when applied. Why a non-soap cleanser? Soaps can dry out and irritate the skin, not desirable for rosacea skin. 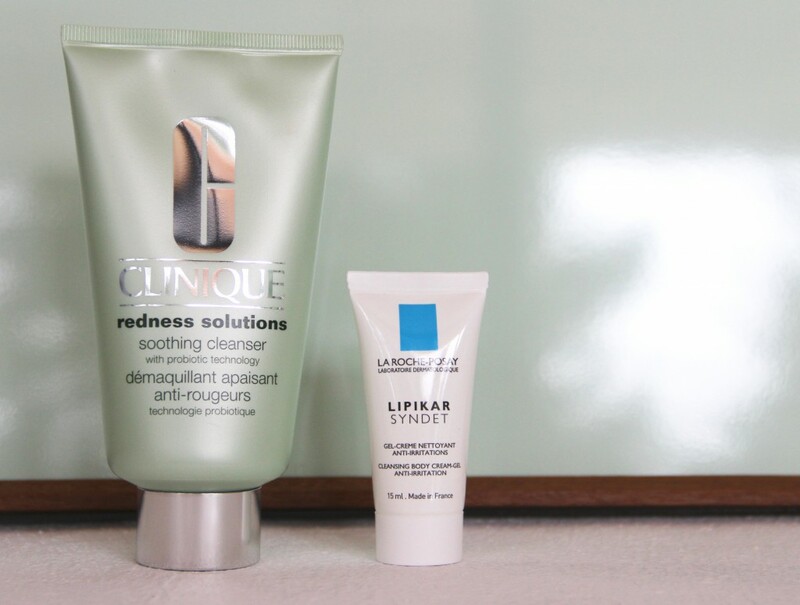 Since I read this, I’ve found two cleansers that do the job for me, namely the La Roche-Posay Lipkar Syndet and the Clinique Redness Solutions Soothing Cleanser*. How to: They’re both non-foaming cleansers, that I, after step 1 (makeup removal) apply to my wet skin, massage lightly in circular motions and rinse off with lukewarm water. The La Roche-Posay Lipkar Syndet has a gel-like formula. Now my skin is ready for the next step of my nightly skincare routine, exfoliation. 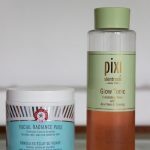 You can read about which product I prefer to use for toning and exfoliation of my skin, in the following blog post. UPDATE: I can no longer recommend the Clinique Redness Solutions Soothing Cleanser as it contains two criticisable ingredients: BHT (Butylated HydroxyToluene) is suspected to be an endocrine disrupting chemical. PHMB (Polyaminopropyl biguanide ) allergenic and potentially cancer-causing substance has since January 2015 been banned for use in personal care products. Read my blog posts series What Are Endocrine Disrupting Chemicals? for further info. *Disclaimer: I’ve contacted Clinique and asked them to send me their Redness Solutions line, including the Redness Solutions Soothing Cleanser. I am not obligated nor paid to mention them on my blog or any other of my social media platforms. It is my choice to show them, as they are a part of my daily skincare routine. water, squalane, glycerin, butylene glycol, phenyl trimethicone, ammonium acryloyldimethyltaurate/vp copolymer, avena sativa (oat) kernel extract, cucumis sativus (cucumber) fruit extract, hordeum vulgare (barley) extract/extrait d’orge, sucrose stearate, sea whip extract, cholesterol, helianthus annuus (sunflower) seedcake, chamomilla recutita (matricaria), acetyl glucosamine, ppg-20 methyl glucose ether, caffeine, propylene glycol dicaprate, caprylyl glycol, stearic acid, sodium chloride, disodium edta, bht, phenoxyethanol, polyaminopropyl biguanide, yellow 5 (ci 19140), green 5 (ci 61570), blue 1 (ci 42090). Hi Caecile, thank you for your post and your great website. Unfortunetly there´s no preferation mentioned in the following post (or I just even have got it). Do you prefer Clinique or Lipkar as second step? THANK YOU! Why not use Cetaphil to cleanse? That’s an option. However, it’s not readily available for me on the Danish market.